Unasuming light industrial unit, housing a traditional stone carving practice. We are a multi-award winning team of classically trained stone carvers, sculptors and masons with over four decades’ combined experience working stone. With workshops based in central London and the South West of England we provide a complete range of architectural and sculptural stone work. We focus our expert attention on material, form, detail and historical context to produce work of the highest grade. We invite you to look behind the scenes of our historic stone carving studio and get an insight into the ancient art of stone carving by watching our team of sculptors and carvers at work. Our team has broad and extensive experience and qualifications in the arts, restoration and conservation. All our carvers studied ‘Historic Stone Carving’ at the City and Guilds of London Art School, a course with international recognition as one of the only remaining institutions offering the extensive training it takes to become a highly skilled stone sculptor/carver. Intrinsic to the profession are not only strong understanding of stone masonry, architectural and art history, but aptitude in academic drawing, clay modelling, ornamental styles, and anatomical study. Our team are also qualified masons and architectural conservators, having studied architectural stone-masonry and conservation at Weymouth College. Our team also hold a BSC in Conservation and BA in Fine Art Sculpture. These qualifications are critical in strengthening and broadening our unique team’s field of expertise. 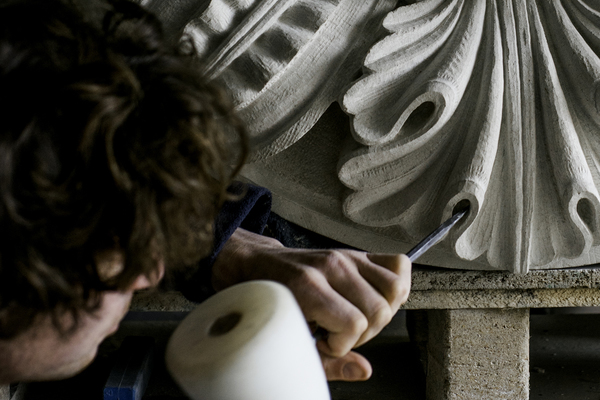 At London Stone Carving we are proud to be described as Master Craftsmen and strive to produce work of a calibre which lives up to that title. Stone carving demands patience, attention to detail and accuracy, the restoration carver must also posses a deep understanding and appreciation of architectural period style and ornamental and decorative forms. The capacity to accurately reproduce is as essential as the ability to re-design and re-interpret. These skills in combination with highly developed draughtsmanship and sculptural skills, allow work to be produced expertly and sympathetically within the context of historic restoration and new build. Our team employs both traditional techniques and modern methods to produce work efficiently, competitively and to the highest standard. Our team’s deep, broad and specialist skill sets mean projects can be organised to maximise each member’s input; responsibility for each aspect is delegated according to our specific strengths and all work is scrutinised and approved by the entire team before being released from our workshop.